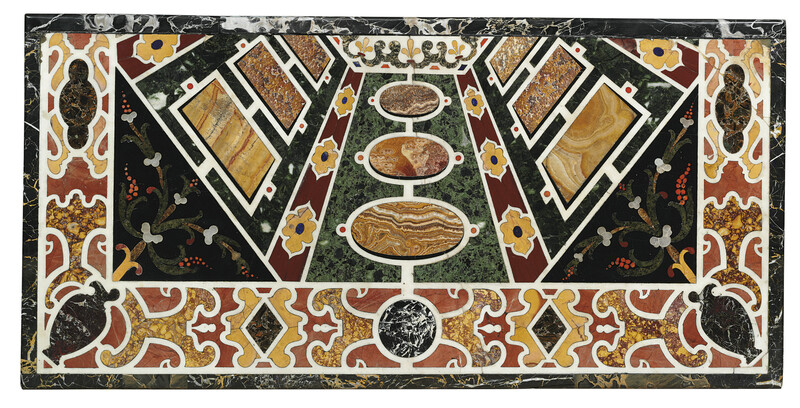 This splendid inlaid marble top displays the fascination with abstract, geometric patterns formed by coloured marbles in Rome and Florence in the late 16th and early 17th century. The art of inlaying marbles, or commesso work, was a mosaic technique of inlaying various irregular sections of rare coloured marbles and semi-precious stones to form a design. Its origins lie with the mosaic-work of ancient Rome known as opus sectile, a tradition wich survived in Rome up until the Middle Ages. Its revival was a conscious attempt to revive the art of ancient Rome, reusing the rare coloured marbles of antiquity of which Rome itself was such a rich source. The earliest inlaid marble tops executed in the Renaissance in Rome were of a stark, geometric design, and often forming a pattern featuring a single panel of a precious marble or alabaster. Commesso work in Rome was particularly associated with architects and designers such as Jacopo Vignola (1507-1573), who is now thought to have provided the designs for the celebrated table supplied to Alessandro Farnese circa 1565, now in the Metropolitan Museum of Art, New York. This table, (presumably cut in half to form the top of a console table), with its fascinating central perspectival pattern formed of panels of alabastro fiorito, reflects this earlier phase of more abstract designs, while the foliate sprays of the corners look forward to the more naturalistic designs of the end of the 16th and beginning of the 17th Century. A table with similar perspectival designs, now at Aston Hall, Birmingham, is illustrated in A. M. Giusti, Pietre Dure, London, 1992, p. 27.